Grand Canyon Airlines is concerned about your right to privacy. When you visit the GrandCanyonAirlines.com, you can be assured that any information you provide to us will be handled carefully. We will never sell or rent your information to any third party. To complete a transaction when a Customer purchases service from a travel service provider (i.e. hotel, show, ground tour, etc.) 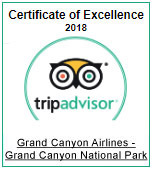 that is accessible through grandcanyonairlines.com. This site contains links to other sites. GrandCanyonAirlines.com is not responsible for the privacy practices or the content of such web sites. Will be treated as confidential by Grand Canyon Airlines.